We use only a special snow white popcorn that's bred for extra tenderness. 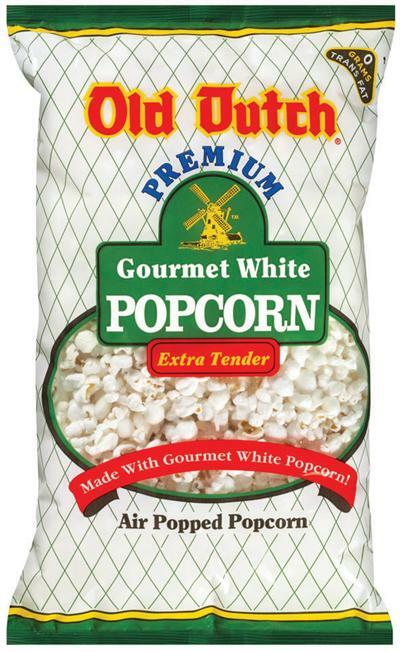 Our Premium Gourmet Popcorn is a snack favorite that we’re sure you’ll love. We use only special premium popcorn that’s bred for extra tenderness. The delicious, air-popped kernels are poppin’ with unique taste that can’t be beat. A special favorite throughout the Upper Midwest, it’s the popcorn of choice for picnics, lunches, hikes, and fishing trips. Ingredients: Popcorn, Sunflower and/or Canola Oil, Salt. On a recent trip I discovered your popcorn in the big 12oz. Bags.It is wonderful. Thank You. I don't order food on-line.....but this is the exception. It is the best bagged popcorn I've every had, and I eat a lot of popcorn! I bought my first bag on a trip out west and was disappointed that I couldn't find it when I got home. I'm so glad I can get it delivered! I love this popcorn, even my husband loves it. Very delicious gourmet popcorn!